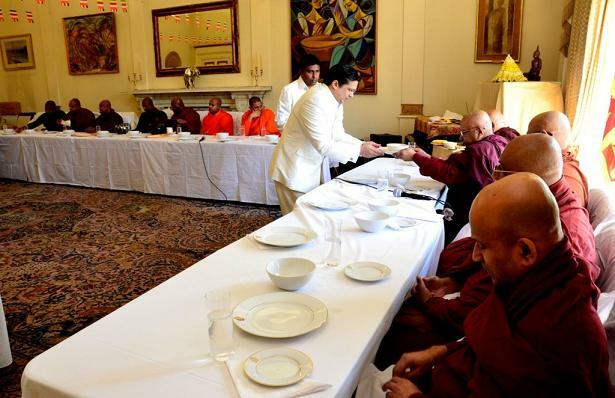 The High Commission of Sri Lanka in the United Kingdom organized an almsgiving for twenty Venerable members of the Maha Sanga representing the Buddhist temples in the UK, on Wednesday 14th May, with the participation of the Sri Lankan community, as part of its Vesak Celebrations, and also to invoke blessings on H.E. President Mahinda Rajapaksa, the Government and the people of Sri Lanka. 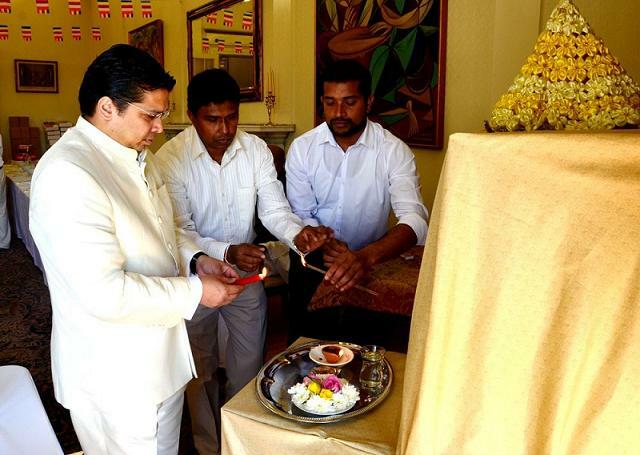 The High Commission premises were colourfully adorned with Vesak lanterns, Buddhist flags and decorations. Chief Sanganayaka of Great Britain & Head of the London Buddhist Vihara Ven. Bogoda Seelawimala Nayaka Thero; Chief Incumbent of the Kingsbury Saddhatissa International Buddhist Vihara, Ven. Galayaye Piyadassi Nayaka Thero; Chief Incumbent of the Birmingham Jetavana Buddhist Temple Ven. Keppetiyagoda Gunawansa Nayaka Thero; and Ven. Maha Sanga from the following Buddhist Viharas also participated at the Almsgiving:- Athula Dassana International Buddhist Temple, Hounslow; East London Buddhist Cultural Centre, Plaistow; Upton Temple, Plaistow; Thames Buddhist Vihara, Croydon; Mahamevnawa Asapuwa, Billericay; Scotland Buddhist Vihara, Scotland; and Redbridge Buddhist Cultural Centre, Ilford. Ven. Bogoda Seelawimala Nayaka Thero, Ven Dr Handupalpola Mahinda Nayaka Thero, and Ven Dedunupitiye Upananda Thero, in their Anusasanas outlined the meaning of the Triple Festival of Vesak commemorating the Birth, Enlightenment and Parinirvana of the Buddha; the universality of Buddhism; and the imperative of unity of all Sri Lankans. In his concluding remarks, Ven Bogoda Seelawimala Nayaka Thero commended the service rendered by the High Commissioner and staff and for their active participation in many Temple events throughout the UK, and that this was reflected in the participation of the Ven Maha Sanga from so many Temples in the UK in the High Commission’s Vesak celebration and almsgiving today. This entry was posted on Wednesday, May 14th, 2014. You can follow any responses to this entry through the RSS 2.0 feed. You can skip to the end and leave a response.